Some might consider organic farming as a sector free from production inputs, but this is not the case – all farming requires inputs of some kind. Organic producers and processors must constantly monitor the ingredients and materials that they use, making sure that everything is approved for organic production. The difficulty is that information about what’s approved is often hard to find, and the Canadian approval process itself is becoming increasingly complicated. This confusing process is an added challenge for Canadian organic producers and processors and puts them at a disadvantage when compared to their US competitors. 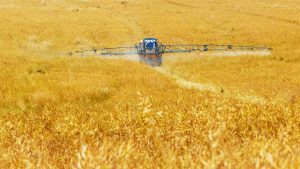 Agricultural inputs or materials are products used in food production, such as feedstuffs, fertilizers, plant-protection products, cleaning agents, and food additives. A complete list of materials considered as inputs can be found in the Canadian Food Inspection Agency’s Input Verification under the Canada Organic Regime document. As inputs are an integral part of agriculture, they are also vital to organic farming. Compared to conventional farming however, there are significantly fewer synthetic products permitted for use. According to the Organic Trade Association, only 25 synthetic active pest control products are allowed in organic crop production, versus the 900+ active pesticides registered for conventional use by the Environmental Protection Agency. Most other organic inputs are derived from non-synthetic sources and all are strictly regulated. Organic inputs must be approved before they are used, and there is a growing market for inputs that meet the standards. Products such as pest control substances and feed supplements have to go through the rigorous Canadian registration process, and must also be approved by certifying bodies. Other types of inputs, such as many fertilizers, cleaning products, and food ingredients, do not have to be registered. With such a small market for inputs and so many regulatory hurdles, organic inputs can be hard to find or don’t exist in Canada. Of those products that are commercialized in Canada, only a small percentage actually pay to be officially listed as approved for organic production. Commercial organic inputs must go through additional steps to become approved for organic production; after being reviewed by the Pest Management Regulatory Agency (PMRA), they must also undergo a review for compliance with the Canadian Organic Standards. Inputs such as pest control substances, fertilizer, and livestock healthcare products however, do not have to undergo review by the PMRA. Products classified as organic in the United States should still be reviewed in Canada due to the difference in permitted inputs. Though this is not mandatory, the U.S. approvals may provide useful product information. According to the Canadian Food Inspection Agency (CFIA), a certifying body accredited by the CFIA must verify inputs used in organic agricultural production or processing. The input and all of its ingredients must be evaluated. It is the organic producer’s responsibility to contact the supplier or manufacturer to obtain full disclosure of the input’s ingredients and production process, and provide the required information to the certifying body. For this to happen, the manufacturer must provide an ingredient list. These lists are typically proprietary, making many companies hesitant to share them. The review process is time consuming for the certifying body, since the manufacturer of the input is not necessarily the party seeking to have the input approved. Once an input has been approved, the certifying body may be limited in sharing information (because of its proprietary nature) or will not willingly share the approved status of inputs with competing certifying bodies or the public, unless the input supplier pays them to do so. If another certifying body has already “pre-approved” an input (i.e. approved and publically listed the input for a fee), their evaluation can be accepted by other certifying bodies. However, it doesn’t negate the need for the producer to seek final approval by their certifying body before use. Also, not all certifying bodies offer pre-approval services because they cost money, are not required, and offer promotion to a limited Canadian market. Thus, only a small percentage of input suppliers are publicly approved and listed. This leaves producers and processors seeking organic inputs at a loss to find public information on available materials. It also leads to redundant input reviews occurring between certifying bodies and conflicting opinions between certifiers on what is allowed, as is demonstrated in the case study of Zocalo Organics. Organic Materials Review Institute-Canada (OMRI Canada): Products with the OMRI Listed® seal are allowed for organic use in accordance with U.S. NOP organic standards but may not meet COR standards. Those approved for Canadian use are listed in the OMRI Canada Products List©. OMRI also has special product seals for products permitted in both Canada and the U.S., and labels them as “OMRI USA/Canada”. OMRI Canada Products List was last updated in 2018 and is a public listing of OMRI Canada approved inputs. Pro-Cert: The Pro-Cert Approved Brand Name Input Substances Directory was last updated in 2017. Ecocert – Canada: The Map of Suppliers of Inputs Reviewed or Attested by Ecocert was last updated in 2018. Manuel des intrants bio (MIB): This list was last updated in 2014, and both the 2014 and 2007 versions are still available online. Organicinputs.ca: A company named Peppersoft attempted to create a compilation of compliant inputs from all of the private certifying body sources. This site was created without funding, and the company planned to have input suppliers pay to list their products. Though some certifiers decided to share their input data, many did not want to contribute. Due to the lack of contribution and the absence of a successful business plan, the website has been closed. Other smaller provincial certifying bodies and organizations have public lists of their members, which can sometimes include input producers or suppliers. Some examples include the Islands Organic Producers Association Membership Listing and the Pacific Agricultural Certification Society Membership Listing. As Canadian organic producers and processors look for solutions, other jurisdictions provide examples of successful input listing and review processes. It is important to note however, that both the European and American markets are much bigger than Canada’s. In these bigger markets, input suppliers are more willing to pay a voluntary fee for greater exposure. In Europe, the Research Institute of Organic Agriculture (FiBL) has created the European Input List. This list is the “one stop shop” for farmers, processors, distributors, policy makers, control bodies, and authorities and includes a total of 7,039 products from all over Europe. According to FiBL’s Pia Pedross, the European listing is voluntary, and input producers or distributors are not obliged to list their products. For the time being, individual products must be submitted separately under each national list. FiBL is currently working on a “Europe-wide database for the administration of companies and products”. 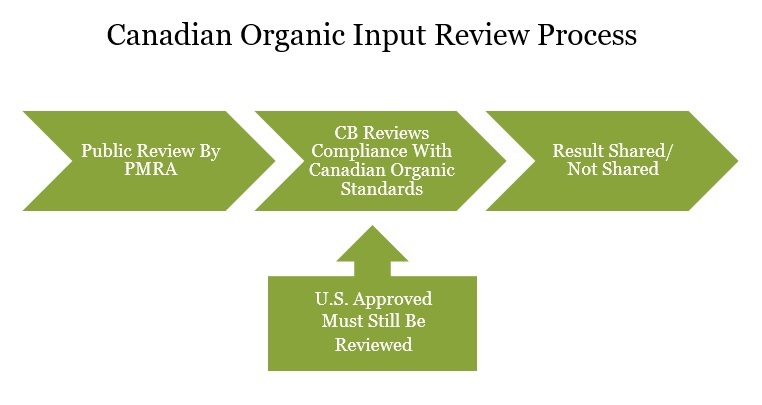 In the United States, the National Organic Program (NOP) addresses input review like Canada, with the exception of Material Review Organizations (MROs). In addition to certifying bodies, MRO’s also verify the compliance of inputs, and provide independent review and assessment services for certifiers, suppliers, input manufacturers, and organic businesses. Certifiers can review and approve inputs on their own, or they can rely on an input review completed by a reputable MRO such as OMRI, the Washington State Department of Agriculture Organic Program, or the Environmental Protection Agency. Though the NOP has published guidelines regarding the use of MROs, the USDA doesn’t currently accredit MROs. The National Organic Standards Board (NOSB) did recommend to the NOP that MROs become accredited but the NOP has so far denied this request, citing legal issues. While the U.S. still lacks a comprehensive national list, OMRI is a well-known source for approved inputs, with a long history of credible review and a comprehensive list making it a “go-to” list for many organic operators. The Organic Council of Ontario has included numerous Ontario input suppliers in their directory, and is hoping to add more in the future. Because inputs aren’t “certified,” they aren’t automatically included. In the meantime, organic input suppliers are encouraged to join. 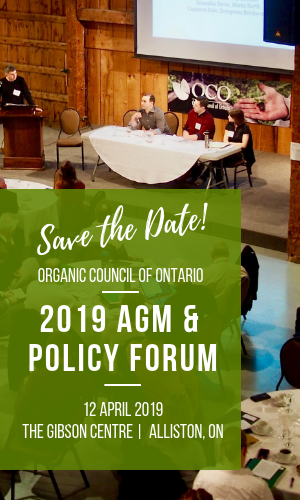 OCO is also working with the Canadian Organic Round Table Inputs Task Force to create a sustainable and comprehensive national list of organic inputs.